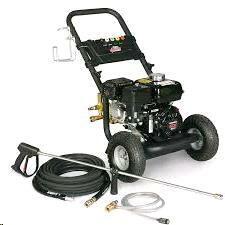 or 2500psi BE pressure washer @6.5hp Honda 3.0 gpm. Good general purpose washer to clean houses, sidewalks, roofs, fences or any surface needing cold water cleaning. A telescoping extension wand can be used to reach high eaves or multi storied buildings without ladders or scaffold. * Please call us for any questions on our pressure washer 2200/2500 psi rentals in Portland OR, Gresham OR, Milwaukee OR, and surrounding metro area.